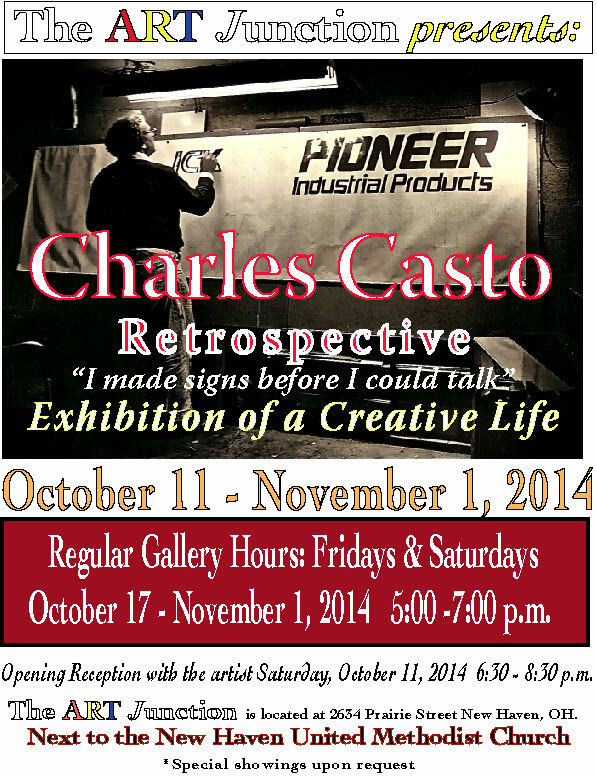 Opening Reception with the artist Saturday, October 11, 2014 6:30 – 8:30 p.m.
Fridays & Saturdays, October 11 – November 1, 2014 5:00 – 7:00 p.m.
Charles Casto artist, art educator, sign painter, and entrepreneur; this exhibition will examine his model of a creative life. Eisner (1998) states, “The act of creation -does not follow an unalterable schedule but is a journey that unfolds…a conversation between the worker and the work”. Come view the varied work that spans a 40-year sign painting/ billboard painter career, 31 years in art education and 50+ years in creative pursuits. I know I never can repay (Fogelberg, 1981). Come to the Art Junction and celebrate a creative life that has inspired many to pursue the arts. View Charles work and examples from former students who are now professional artists like Steve Axtel, Don Moore and others.